The New Year isn't officially in full swing until Pantone announces its color of the year. Each year Pantone predicts what it believes will be this year's trendy fashion color. Since 2000 Pantone has made these predictions based on trends in the cultural climate. Everyone from fashion designers to interior decorators take Pantone's predictions very seriously. From runways to home decorating, Pantone's color of the year is used in various aspects of fashion and design. For 2017 Pantone made an interesting choice, picking “Greenery” as it's 2017 color of the year. Greenery has led to some confusion. What exactly is Greenery? 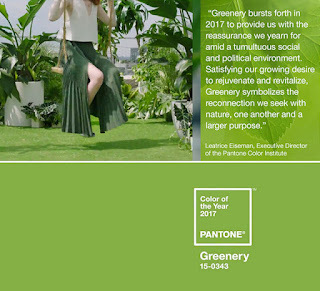 Is Pantone suggesting that different shades of green will be hot in 2017? Actually Greenery is its own shade. According to Pantone's website Greenery "is a fresh and zesty yellow-green shade that evokes the first days of spring when nature’s greens revive, restore and renew." Greenery is also a very neutral color. According to Pantone Greenery is “nature's neutral,” and reflects modern trends towards a green lifestyle. Fashion, in Pantone's opinion is moving with the trends towards natural in other aspects of life. Travel is impacted as more people seek the outdoors, and urban planning is more focused on green, even in the cities. Pantone believes that 2017 is the year when fashion and interior decorating moves to reflect these changes in society. As a color, Greenery is actually yellow-ish. It's a zesty yellow-green shade that offers simplicity and statement. So how do you wear Greenery? Believe it or not, Pantone is not making a bold statement. You can already find this shade on the runways, and in the stores. Even some luxury cars are coming out with this color. The great thing about Greenery is it works all year around. For all the talk about Greenery as renewal, it's a shade that you can use any time of the year. A more neutral color means Greenery can be paired with most shades. While bolder colors are popular in the later parts of the year, lighter shades work best in the spring and summer. Greenery works with them all! If your wardrobe needs an update, Greenery is the perfect color choice for you. It's shade of renewal will give your outerwear a significant upgrade. Greenery works good on its own, as a lovely choice for an Easter dress. But you can also use Greenery as an accent with those bolder colors we mentioned above. Use it in a gold bracelet for a colorful addition to your jewelry. Add some Greenery in the form of a scarf with a bold jacket for cold nights out. The options are almost endless. So get creative with your wardrobe this year and look for lots of new fashion items in stores soon with Greenery as the focus. Don't forget to pair your fashion with the right scent. Scents Unlimited offers hand-blended fragrances in various beauty items. View our catalog and get more tips on our Pinterest boards!